The Garmin DriveSmart 70LMT is a advanced navigation that features a 7 high-resolution touchscreen display and provides users with a wealth of information in great detail with traffic avoidance and lifetime free traffic updates. Preloaded with detailed, street-level maps of North America along with POI's this GPS makes it easy to find addresses. 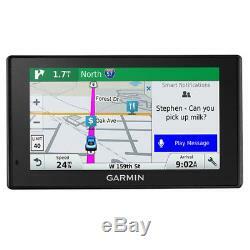 Garmin DriveSmart 70LMT, North America-R Garmin DriveSmart 70LMT - North. 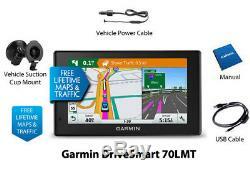 Garmin DriveSmart 70LMT (North America). Lane Assist w/ Junction View. Choice of Route Setup: With this fun and innovative feature you can customize your travel experience. Easily set up your route on the basis of time, distance or scenery. If you are in a rush you can direct your GPS to give you directions that will get you to your destination as fast as possible. Maybe you are not so concerned about time but would like to cover less distance. Program your GPS to travel within the city, so you can minimize mileage. This function also allows you to take a less traveled route. Choose directions that are less direct, but offer you great, scenic views. Custom POIs: With the custom POI's function you can add additional points of interest to your GPS internal memory. Load restaurants, shopping areas, or tourist spots that interest you and may not be recognized by your system. You have the choice of either entering your custom location manually or transferring it from your computer to your GPS system with the appropriate software. Lane Assist w/ Junction View: The Lane Assist feature on Garmin GPS systems guides you to your correct lane when approaching a turn or exit. Easily navigate through unfamiliar areas when viewing the lane assist page. This function also offers a view of upcoming road junctions and a bright colored arrow that indicates what side of the junction you should be driving on. This feature can be accessed directly from the main map page. Millions of Points of Interest: Pre-programmed POIs make it easy to find gas stations, restaurants, ATMs, coffee and more. Search by name or category near your position or near any city. Preloaded maps: Your GPS system is equipped with a great selection of preloaded maps, which will help you better navigate roads in the US. With this feature you do not have to worry about loading compatible maps on your own, simply turn on the device and enjoy detailed maps of future destinations. Route Avoidance: This function allows is also centered on the idea of creating a GPS unit that can be customized to the user's specific needs. Use this tool to avoid highways that you do not want to travel on, tolls that you do not want to pay and more. If during certain times you do not want to follow the exact GPS direction, use route avoidance to steer clear of places you would rather not cross. Speaks Street Names: The Text to Speech Technology utilizes speech synthesis to convert written text into speech. Speech synthesis is known as the synthetic production of human language. The computer in your GPS system looks at upcoming street text, which is being displayed on the screen and uses its internal synthesizer to pronounce those street names. These voice prompts allow you to keep your eyes on the road and your hands on the steering wheel. Text to speech does not utilize pre-recorded, generic audio bits. 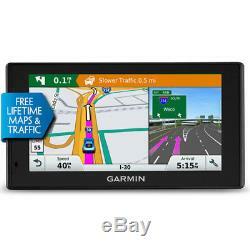 This technology allows the GPS to deliver more detailed directions, which make navigating new areas much easier. Speed Limit Indicator: This tool gives you up to date information on the speed limit posted on most major highways, freeways, and neighborhood roads. With this tool you do not have to worry about receiving a speeding ticket, you will always know what the limit is and if you are obeying the law. Driver Alerts: This provides awareness, including upcoming sharp curves, school zones, speed changes and more. Please allow us the opportunity to resolve any issues before opening disputes and/or leaving feedback. If the item includes an ac power adapter for use, it will be 120 volts. Please ensure that this product is compatible with the standards within your country before purchasing. The item "Garmin DriveSmart 70LMT, North America-R GPS with FREE Lifetime Map Updates" is in sale since Monday, May 21, 2018. This item is in the category "Consumer Electronics\Vehicle Electronics & GPS\GPS Accessories & Tracking\Other GPS Accs & Tracking". The seller is "pricebreak-deals" and is located in United States. This item can be shipped to United States, Canada, United Kingdom, Denmark, Romania, Slovakia, Bulgaria, Czech republic, Finland, Hungary, Latvia, Lithuania, Malta, Estonia, Australia, Greece, Portugal, Cyprus, Slovenia.